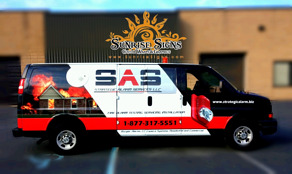 Strategic Alarm Services in Atlantic City, NJ knows their all-white vans won’t do the trick if they want to build their brand fast! The Solution? Fleet vehicle wraps to turn their fleet of vans into stunning one of a kind moving billboards that always advertise, even when parked!